The biggest star of golf as it was made available to the masses, Arnold Palmer sits firmly among the greats of the game. While his overall stats may come up short to Tiger Woods and Jack Nicklaus, Palmer is still one of the most beloved figures in the history of golf. 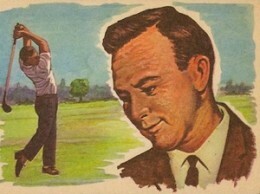 Success on the course and his overall fan popularity puts Arnold Palmer golf cards high on the collecting radar. 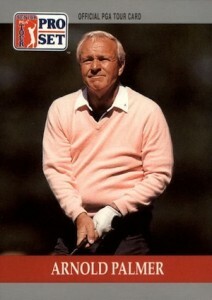 Shop for Arnold Palmer golf cards on eBay. Arnold Palmer made his professional debut in 1954 but card collectors had a much longer wait for "The King." 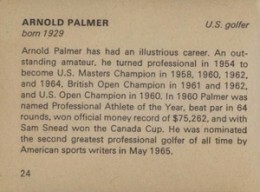 Even after his first card was available, inconsistent golf releases and the fact that Palmer's prime years came during the 1960s resulted in a very limited cardboard checklist. 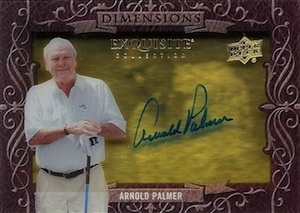 Since 2001, golf releases have become more common and Arnold Palmer cards have been a regular inclusion. For more information, view our detailed Arnold Palmer collecting guide. Pre-dating his official rookie card by nearly three decades, 1965 Bancroft Tiddlers Giants of Sport presents collectors with the earliest card for Arnold Palmer and, for many collectors, his true rookie card. The vintage English release is a traditional card in most aspects, but the hand-cutting process makes it difficult to find high grades. 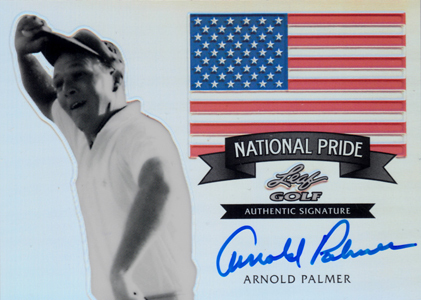 Also, if collectors want the complete Arnold Palmer card, they will need to track down a second card from the set. 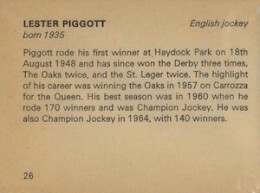 The back of Palmer's card features English jockey Lester Piggott, and footballer Stanley Matthews' card is the place to find the actual card back and bio for Palmer. 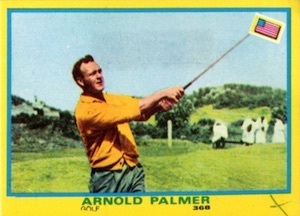 Another vintage golf card for Arnold Palmer, the colorful release is part of the multi-sport 1968 Mira Tuttosport I Campionissimi set issued in Italy. Originally intended to be affixed to an album, the card backs are normally found in a poor condition. Arnold Palmer turned pro in 1954 and it was over 35 years before his "official rookie card" was released in 1990 Pro Set Golf. The bland design, high production numbers and long wait were not an ideal combination and values remain very low. 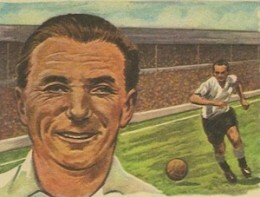 Still, as the only rookie card for "The King," the card is notable. 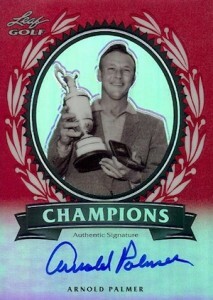 The Arnold Palmer rookie came as part of a 100-card factory set and sealed boxes can be found for just a few dollars. As has been the case for golf collectors over the years, there are large gaps between major releases, especially before Tiger Woods began to dominate. The next noteworthy option for Arnold Palmer came in 2001 SP Authentic Golf. 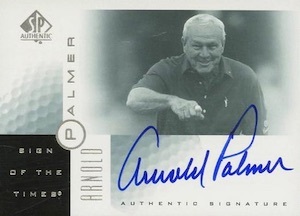 Featuring one of the first pack-pulled autographs for Palmer, the Sign of the Times insert has an appealing design and a large on-card signature. 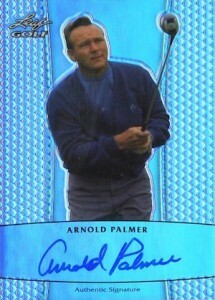 While the 2001 Sign of the Times autograph for Arnold Palmer is one his most popular cards, the first autograph for "The King" is found in 2001 Upper Deck. Part of the Player's Ink insert, the scorecard design has a more aged feel, but still presents Palmer collectors with a great signed card. One of the earliest autographed relics for Arnold Palmer, the Signature Shirt Singles design is a little busy but the on-card-autograph, tournament-worn shirt piece and limited print run make it a hit with golf collectors. The signed card is found in 2003 SP Game Used. 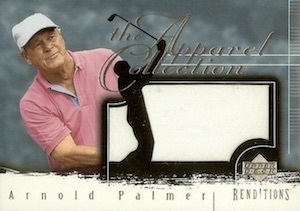 While it is one of several Arnold Palmer relics available in 2003 releases, the 2003 Upper Deck Renditions Apparel Collection card stands out based on the large event-worn shirt piece. The short-lived golf product also offers a gold parallel that is numbered to 25. 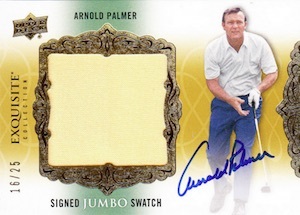 Leaf might not get the same recognition as Upper Deck among golf collectors, but those searching for an Arnold Palmer autograph with a modern look should check out 2012 Leaf Metal Golf. The chromium product includes several different signed cards for Palmer and a variety of Prismatic parallels. 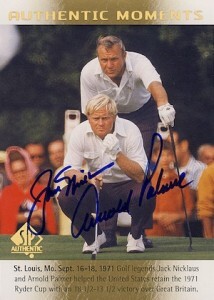 Although the base autographs are not numbered, Arnold Palmer is among the short prints, with an reported print run of 53 copies. Technically a baseball product, Allen and Ginter has long been known for a strong crop of non-baseball signers. 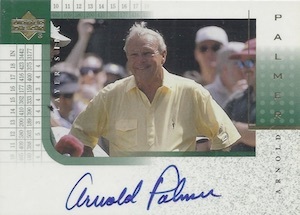 Arnold Palmer was included in a stacked 2012 Topps A&G checklist featuring framed mini autograph cards for several big names outside the baseball world. In addition to the base signature card, which does not surface too often, there is a very limited red ink parallel that is hand-numbered to 10. Following the high-end trend that is sweeping the hobby, golf was one of the last sports to jump on board. 2014 Exquisite Collection Golf is the most premium product for the sport to date, and offers multiple Arnold Palmer autographs. 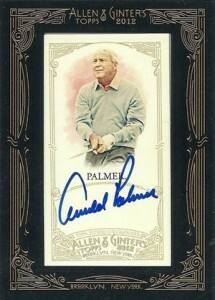 Several quality designs that feature on-card autographs and limited print runs can be found for Palmer. Pairing two of the early greats of the sport and some of the best golfers in history, 2014 SP Authentic Golf includes a signed version of the Authentic Moments subset card that features Arnold Palmer and Jack Nicklaus. Signed on-card by both superstars, the print run is unknown, but the card is very limited. Arnold Palmer, Relic. 2012 Allen Ginter. Super cards for sure. Highlight of my golf collection a 1/1 Arnold Palmer / Jack Nicklaus button card. Still can’t believe I pulled that year a few years ago. RIP Arnie! Arnold Palmer 2012 UD SP Authentic Golf Immortal Ink Signature Auto #10! SSP!